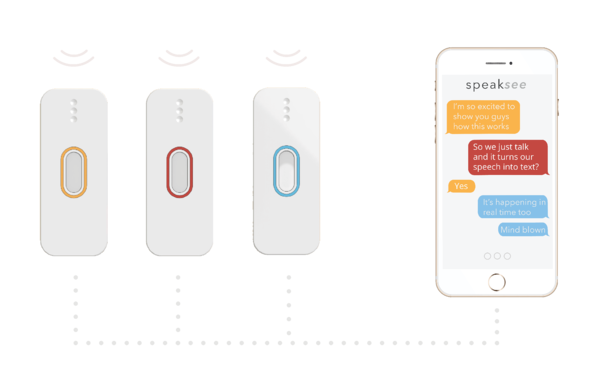 SpeakSee, a start up out of Rotterdam, The Netherlands set out to create a revolutionary device that would make group conversations accessible for deaf or hard-of-hearing individuals. Unlike hearing aids that amplify sound and are not always effective in a group setting, SpeakSee’s device consists of a set of portable microphones that transcribe speech to text in real-time through speech recognition, enabling users to follow and engage even when multiple people are taking at the same time. To make this new device a reality, SpeakSee needed an embedded Wi-Fi solution that provides high-speed, reliable connectivity in a small form factor. The solution needed to be ultra-low power and cost effective enough to embed in each of the microphones and communicate back to a smart phone application in real-time. Speak-See selected Silex Technology’s SX-ULPGN embedded wireless module to provide the connectivity they needed while meeting their power, size, and cost requirements of their initial prototype. This module, designed specifically for mass-market IoT applications, has an internal CPU that can act as a host with the application running from the internal memory and also has the ability to run in hosted mode via an AT interface. Silex Technology worked closely with Speak-See to provide extensive advisement and support throughout the Wi-Fi module selection, implementation, and design phases of the project. SpeakSee uses sophisticated microphone technology that ensures the system accurately captures conversations, identifies different speakers and transcribes conversations into text, in real-time, regardless of background noise. This dramatically improves audio quality and accuracy of the transcripts. SpeakSee even uses advanced speech recognition algorithms to transcribe speech to text with punctuation built-in. SX-ULPGN Wi-Fi modules are embedded into each of these microphones and to provide a feature-rich, intelligent Wi-Fi solution that integrates a full Wi-Fi stack, full networking/security stack, and embedded CPU and memory for on-chip application development. The SX-ULPGN module, based on QCA4010 radio from Qualcomm, is a feature-rich, intelligent Wi-Fi solution that integrates a full Wi-Fi stack, full networking/security stack, and embedded CPU and memory for on-chip application development. This module can operation in two configurations: as a communication engine to an external MCU or as a complete standalone system with the application running directly on the radio. The SX-ULPGN is ideal for consumer embedded wireless products, like this device from SpeakSee, that need a high level of flexibility and efficiency. The SX-ULPGN module allows OEM’s to design Wi-Fi connected products in a cost-effective way. At Silex Technology, our mission is to be difference makers – for our employees, to our customers, and in our communities. This application is one example of how we enable customer success through support, advisement, and innovative products that helps end-users benefit from the advantages that a networked society offers through modern computer technology. For more information about Silex Technology’s Wi-Fi Solutions for consumer devices, visit out IoT Connectivity Solutions page. Founded in 2016, SpeakSee is an innovative assistive technology company with a strong sense of purpose: making conversations accessible for everyone. For more information, visit their site. For more information on Silex custom Wi-Fi modules, contact us.